The list is quite extensive. And the ‘solution’ you are given: take the pill and carry on. Little we knew my early life experiences and nutrition got me there and it could actually be fixed without drugs. And, by the way, I’m a passionate ‘anti-pill’ advocate now! At 30 I discovered my passion for strength training and that lead to me finding and going keto and graduating as a Nutritional Therapist in the following years. 7 months into the LCHF + Intermittent Fasting lifestyle I was clear of PCOS after two decades of suffering, to my doctors astonishment. And I discovered you can still lift and grow strength like a badass without the need for carbs (and with MUCH less gym time than we were made to believe). 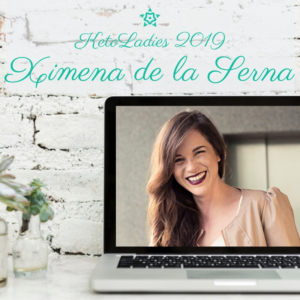 Today, together with my main outlet for empowered women at Ximenadelaserna.com, I run SinCarbohidratos.com, a site + LCHF challenge where I’m helping dozens of Spanish speaking women overcome PCOS, diabetes, hormonal issues and optimise their DNA expression through Nutrigenetics and Nutritional Therapy.